(Jul, 2003) - Vince lives and works in Virginia Beach, Virginia with his wife Velda and granddaughter Nicole. I was born in 1940. My earliest memories of music were at the age of three. My mother always had the radio or records playing. At age six I started to play the ukulele. I found that after I learned the chords to one song, I could play the same chord structure for other songs. I converted the chords to an old upright piano in my grandmothers basement and added melody with my right hand and became a piano pounder. At age 15, while in the 10th grade in Baltimore, I started a seven piece rock and roll band; played lots of record hops and a local TV dance show called "The Buddy Dean Show." We recorded a record on the old Jay Wing label but the record company went bankrupt (probably because of us). In 1958, we started to play local clubs with a show based on Prima's stuff, even with a Keely Smith impersonator. We did quite well, but the band eventually fell apart, so I joined the Air Force. Upon returning, I soloed at piano bars and sang, but the night life was not compatible with marriage so that ended my professional efforts. I started playing for my own enjoyment in the 80's with the old Yamaha PSR's 5700, 6700, 6000 and now I own a Tyros. I love all music but particularly like the 40's, 50's and 60's. Favorite artists include Mancini, Dr John, Prima, Fats Domino, TD and all the big bands of the 40's. I hope you enjoy this album as much as I have enjoyed all the artists on psrtutorial. This is a fantastic site. Thanks to Joe for the opportunity to contribute. 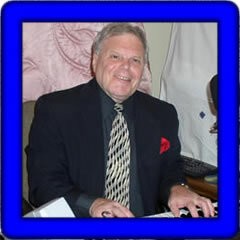 Vince has provided an additional 80 songs in midi format. These were created on the original Tyros (T1). Individual songs are shown in the table below and any one song can be downloaded by right-clicking on the song link. You can download all of Vince's MIDI songs here: VA-T1.zip. The table displays the song title, tempo (T), time signature (TS), lyrics (L), chords (C), where possible, the style used, the original volume (V), and the keyboard used (K). Recent songs are in the Jukebox above. The list below includes all of Vince's songs arranged alphabetically by song title and keyboard. Click on the song title to listen to and/or download the song.